Today's businesses are re-evaluating their business models, requiring new ways to cut costs and seeking innovative techniques to streamline internal business processes. IT departments have the attention of top management and with this a real opportunity to better position the business for the short- and long-term. The imageCLASS MF5850dn is uniquely designed for the needs of today's IT professional. Does your CEO expect you to minimize operating costs spent on printing and document management through IT enhancements? 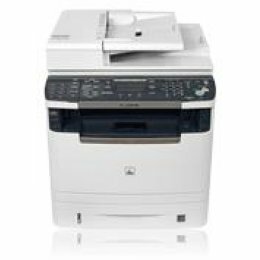 The MF5850dn is outfitted with cost-saving tools such as all-mode auto duplex functionality and Department ID Management, which enables you to set limits on who can use the machine and how much they can print, copy or scan. When the machine is not in use, it expends just 3W while in Energy Saver Mode, helping you save money on your electric bill. Are you looking to create an environment that lets your employees communicate more effectively and efficiently while also improving record-keeping? With built-in Fax Forwarding functionality, they will be able to automatically forward their incoming faxes to another fax number, so these documents will reach their intended recipients as efficiently as possible. By scanning and sending documents in Canon's Hi-Compression PDF mode, they can reduce scanned file sizes significantly while maintaining outstanding text and image quality. Is how an MFP fits within your existing IT environment a key consideration? The MF5850dn includes built-in security and can be shared by one or many, with a standard Ethernet or a wireless option. Critically, you will be able to manage the device from your desk through an embedded web server (Remote UI), which will give you the freedom to view and modify network settings or retrieve an activity log. Your small business or workgroup will be better prepared for its newest business challenges with the imageCLASS MF5850dn.